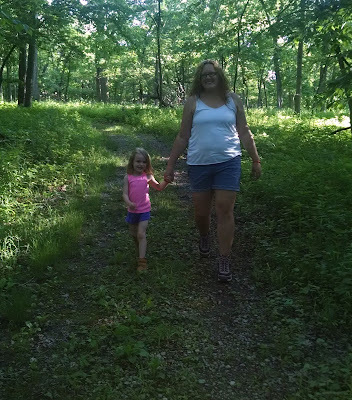 We had a great long and accomplished weekend! 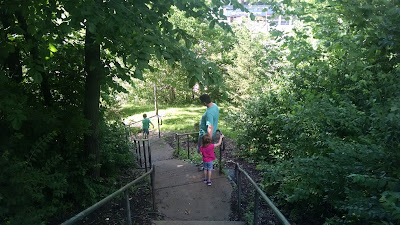 Saturday we took a day trip to Kansas City (about a 3 hour drive from Des Moines) to go to IKEA. 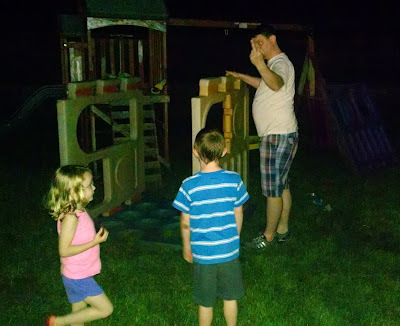 I needed to stock up on little chairs, extra tables, and odds and ends for our busy summer at daycare. 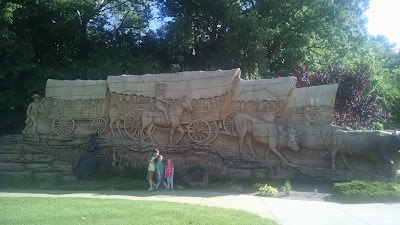 While we were in KC, we ate at Fritz's train care restaurant and walked on Pioneer Trail in Shawnee, KS. 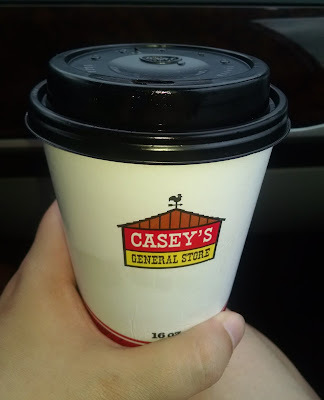 Gas station coffee got me through our day trip to KC. 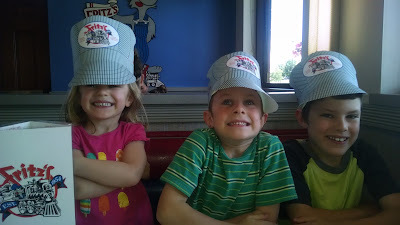 This was our first time at Fritz's and the minis loved it! 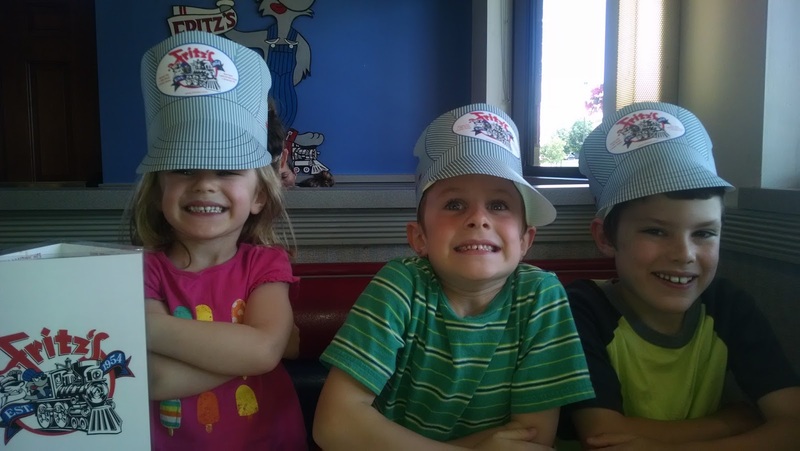 Trains deliver your meals right to your table. The restaurant was obviously incredibly kid friendly but it was by far one of the loudest restaurants I've ever sat in.The entire time we were there, Elizabeth and every other kid in the restaurant shouted "choo choo! 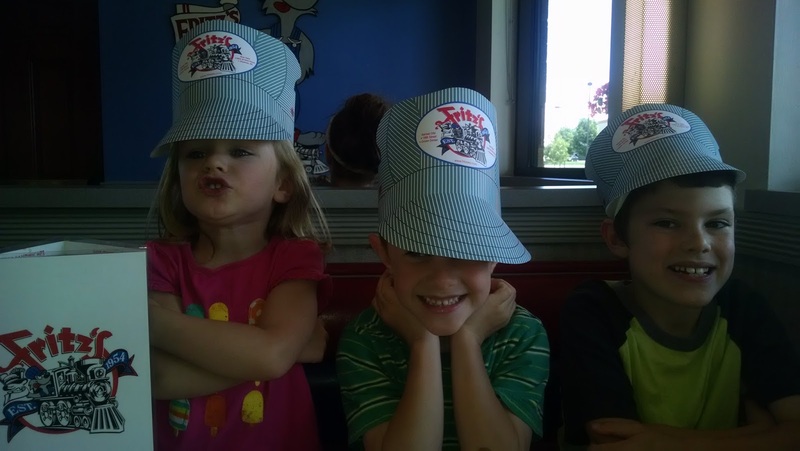 Chugga chugga choo choo!" 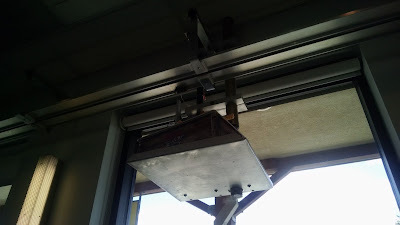 The train goes around the top (near the ceiling) and drops the food onto a platform that is lowered to the table. 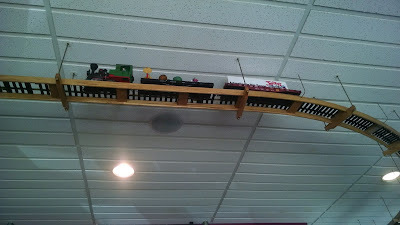 The minis were mesmerized watching the trains deliver food to each table. The reason for our road trip to KC: IKEA! 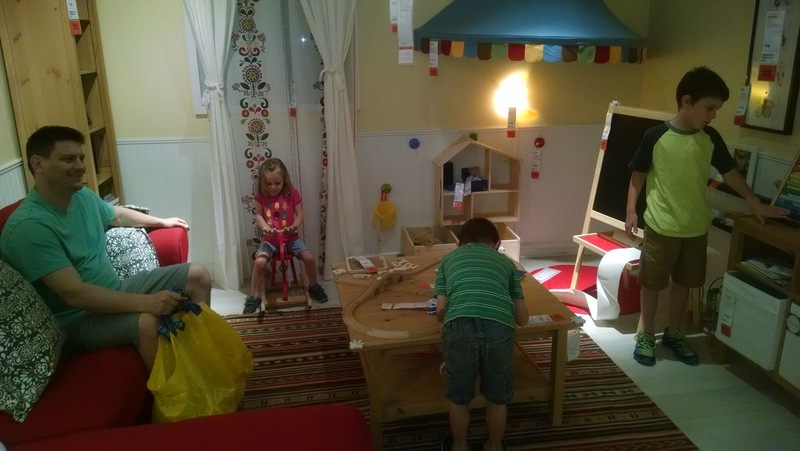 We got lots of new (cheap) tables for daycare, little stools, toys, and more. 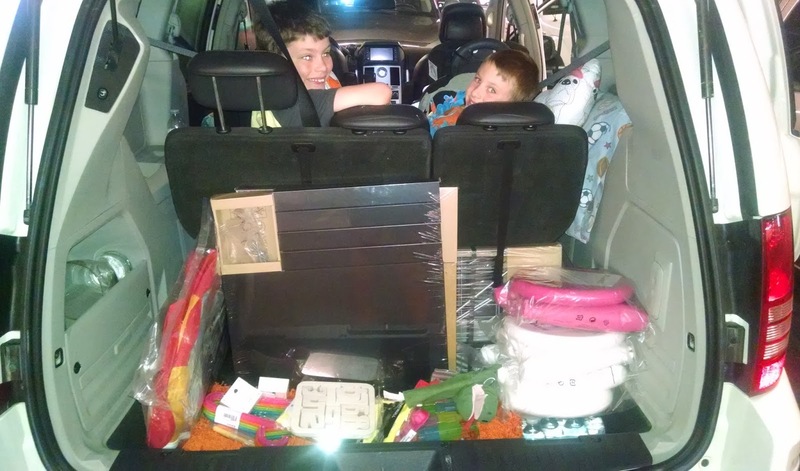 Very successful trip that didn't break the bank AND it all fit nicely into the back of the minivan! 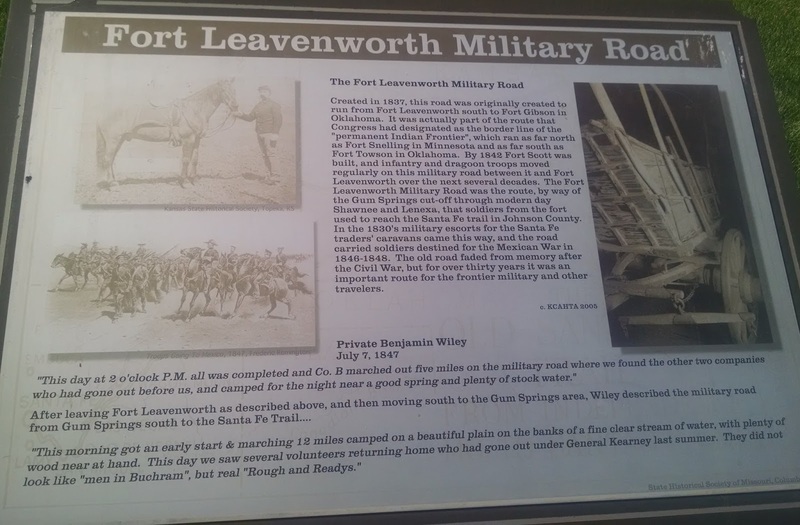 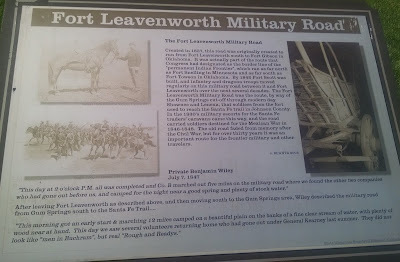 We came across this awesome historic trail right in between the restaurant and IKEA. 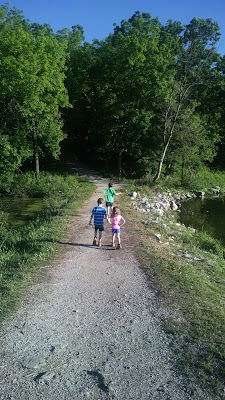 After all of our shopping, we took the kids on a short walk and for a quick stop at a park before we began our trek home. The minis love stopping at gas stations (to them, gas station stops with getting "special snack" thanks to our Indiana Road Trip). 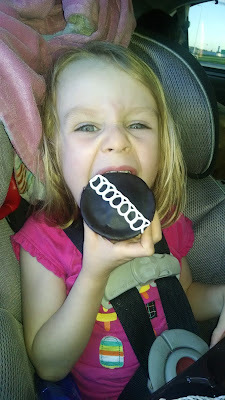 This time, the minis tried their first Hostess Cupcake (they weren't overly impressed). 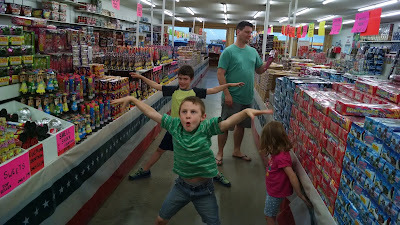 Our last stop included a stop at Fireworks World. 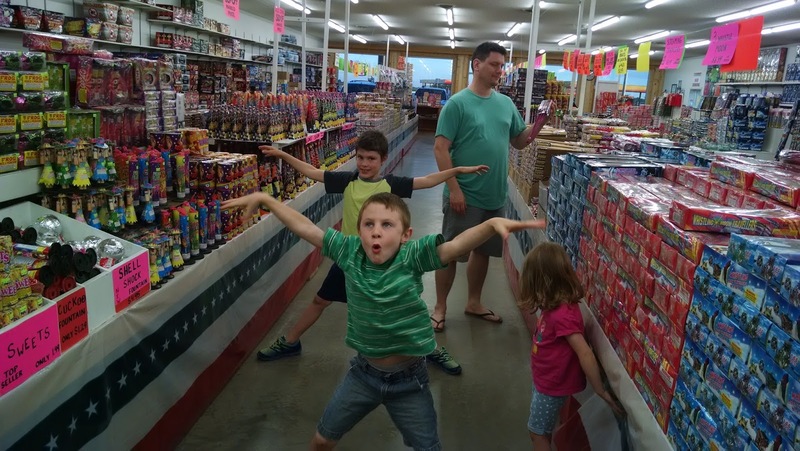 We're all prepped for the 4th! 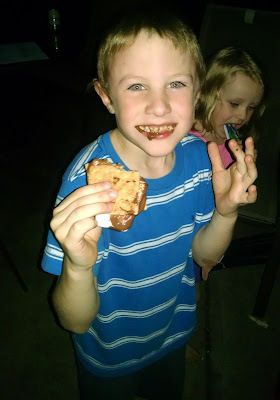 We got home later than planned, but everyone was so excited about the new sparklers that we had to try some out. So we stayed up even later. To say Hubs and I were exhausted by the end of the day is an understatement. 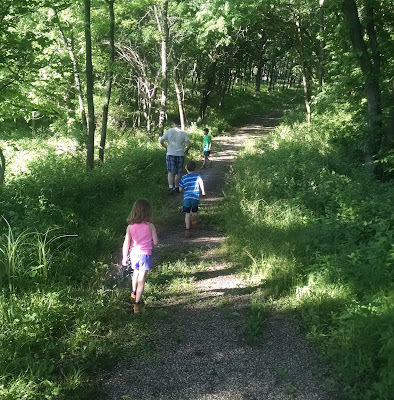 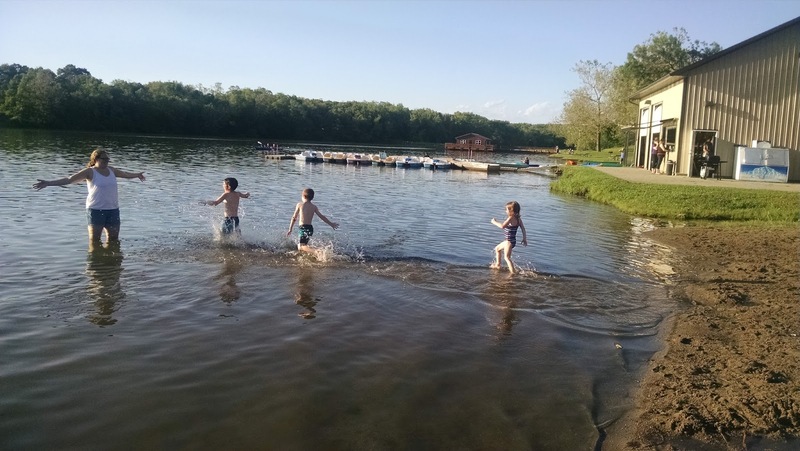 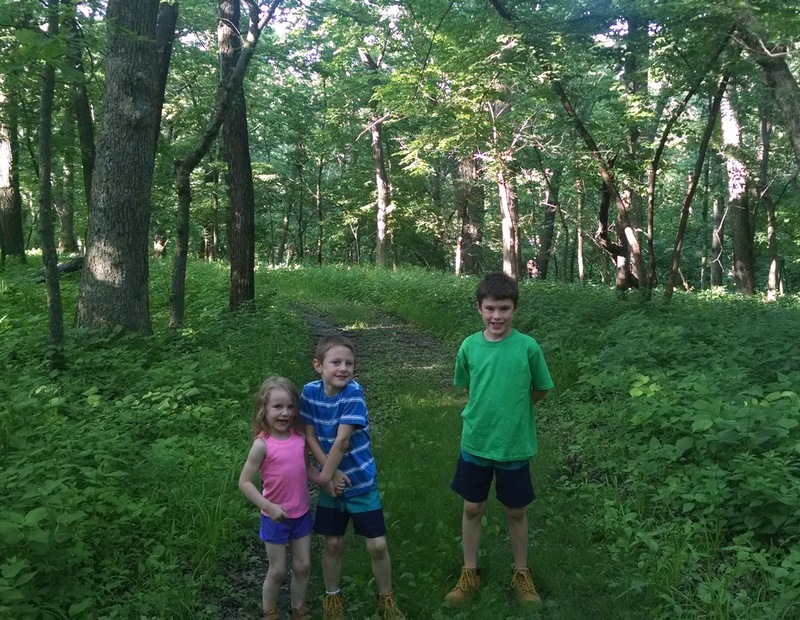 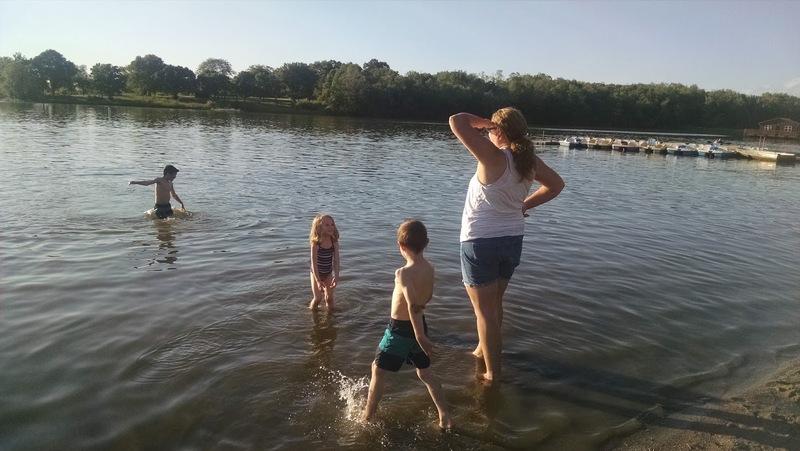 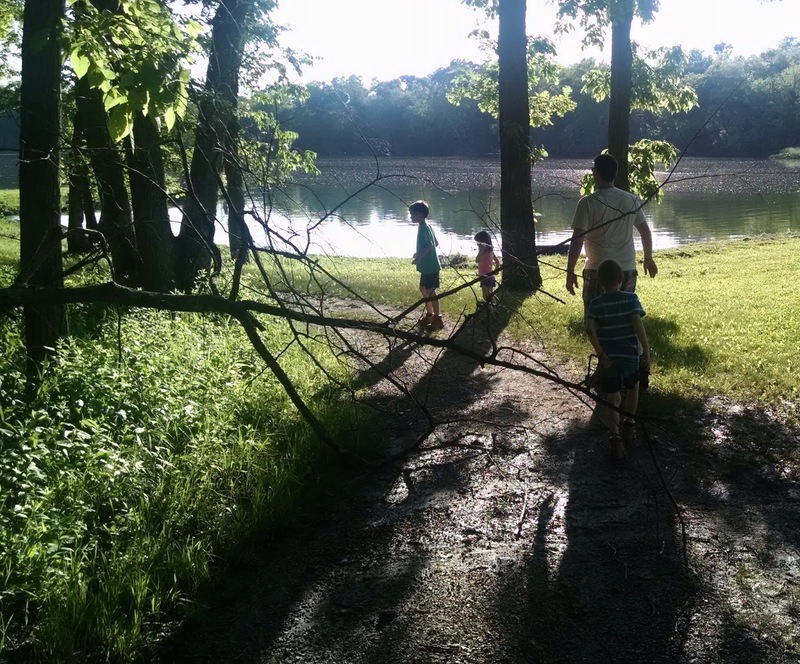 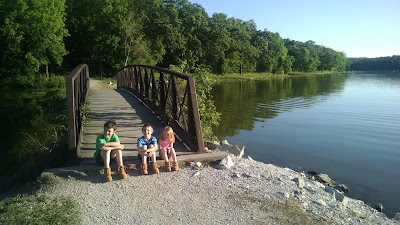 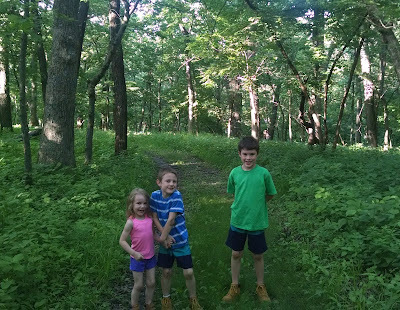 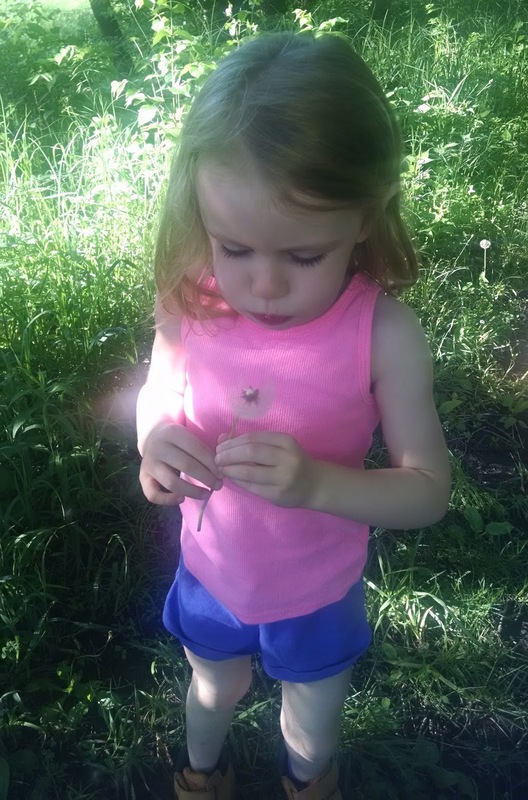 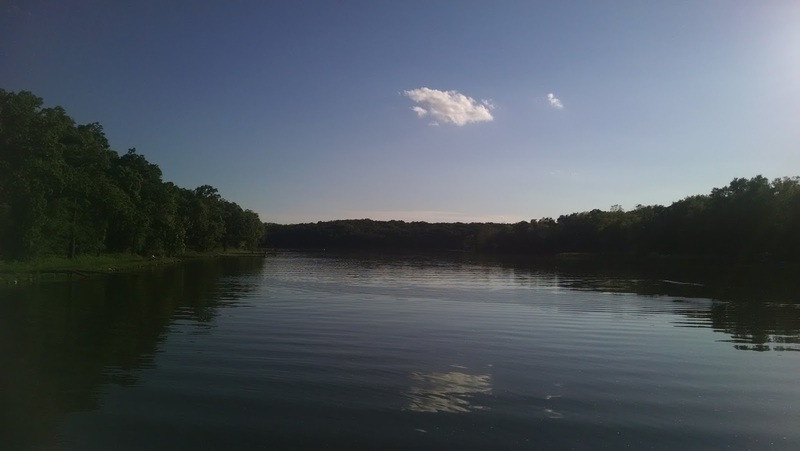 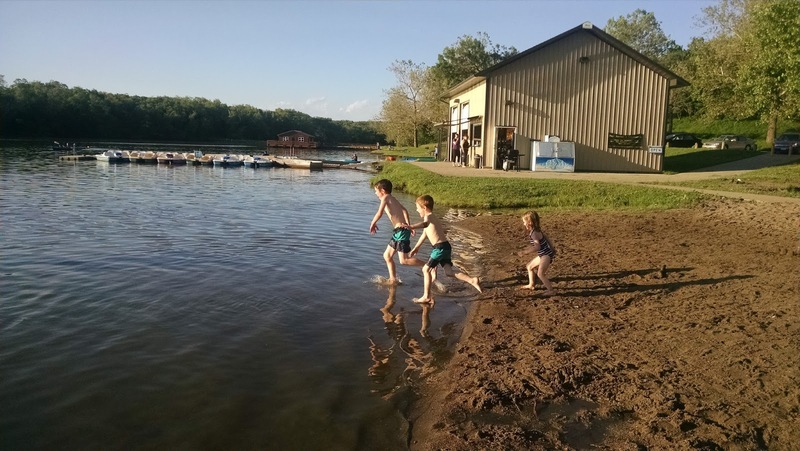 Sunday included organizing, putting together our new items from IKEA, and a hike and lake swimming at Lake Ahquabi (in Indianola, IA). 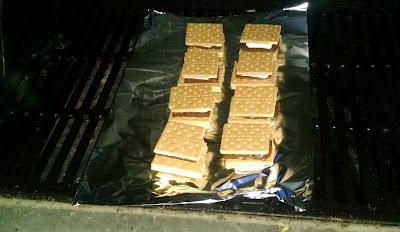 We concluded our day with s'mores on the grill, sparklers, and playing in the backyard until far past bedtime. 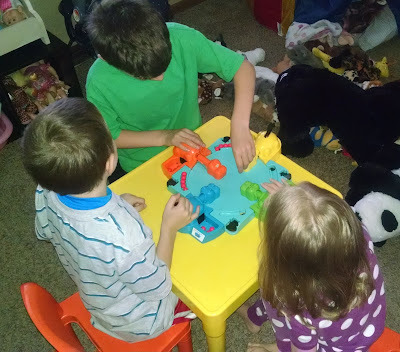 In case you haven't heard, the boys woke the household up at 7:45 by playing Hungry Hungry Hippos. 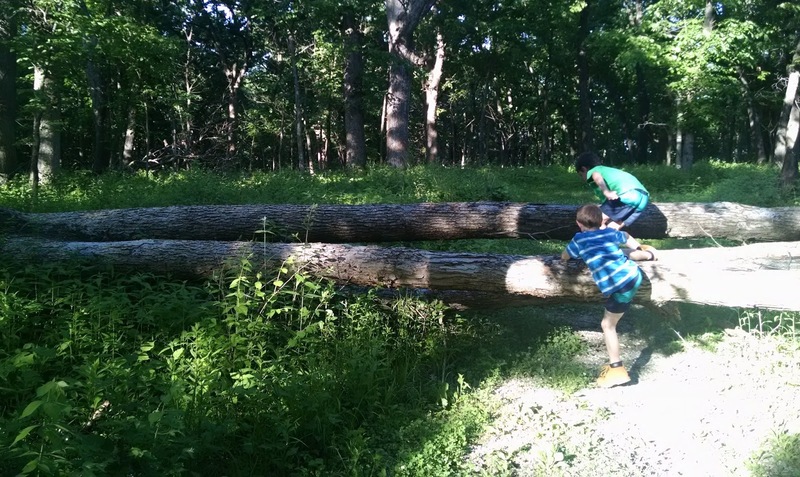 On their hardwood floors, making it that much louder. We were not pleased, but they played the game all morning which freed up Hubs and I to get housework done. 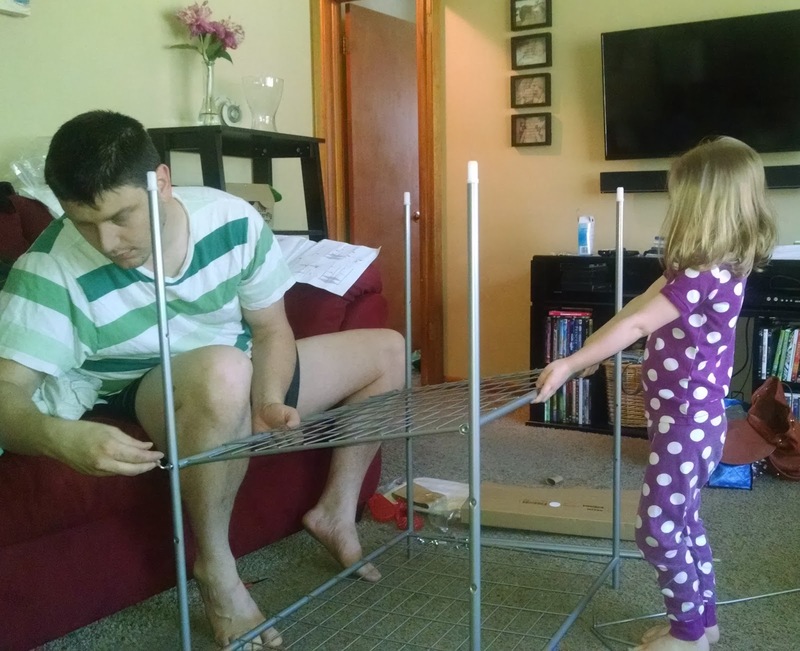 Hubs had "help" while we put together shelves. 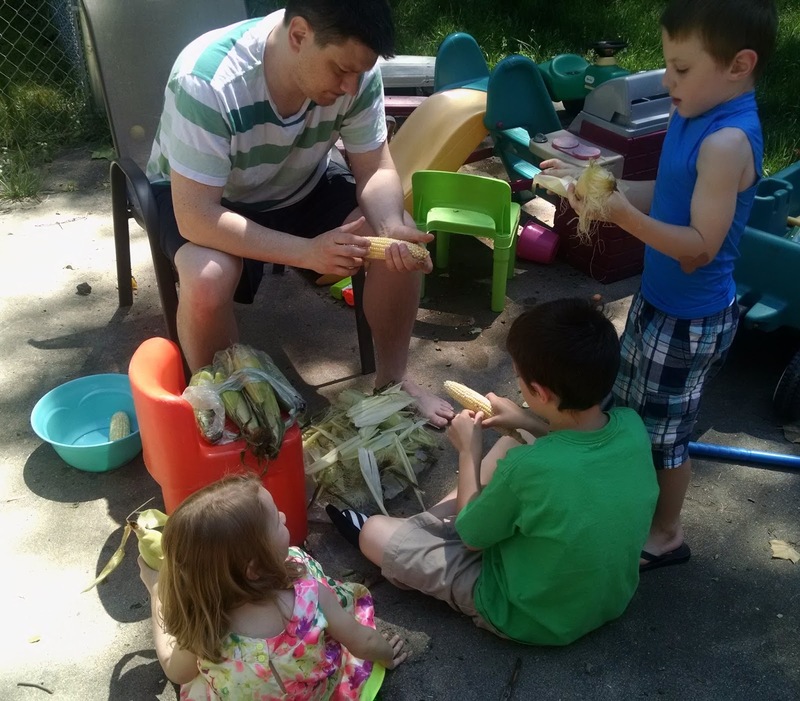 Shucking corn for our lunch cook out. We ate so many grilled hot dogs and brats this weekend to last me all summer. 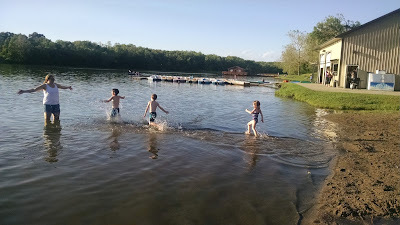 After naps (which were more than needed), we went to Lake Ahquabi for a quick hike and swim in the lake. The boys favorite part of the hike was climbing over a fallen tree. 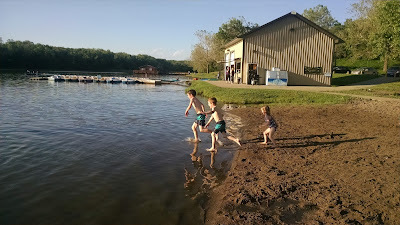 Having races into the water. S'mores on the grill is one of our summer favorites! Hubs wasn't exactly thrilled I was documenting him forgetting how to put together the cube climber. 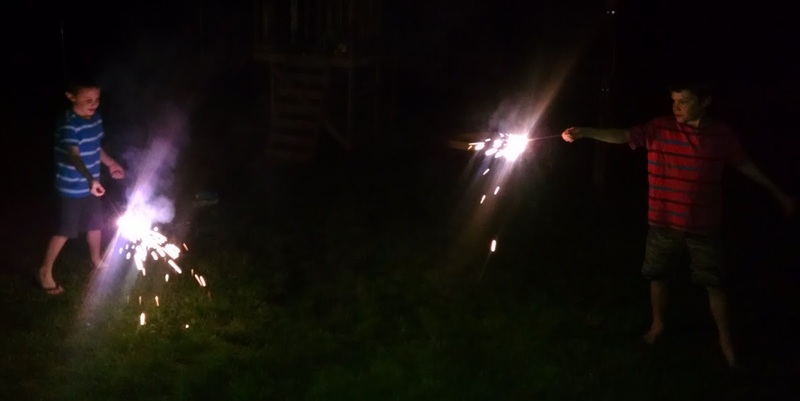 Another night of sparklers and being up too late. 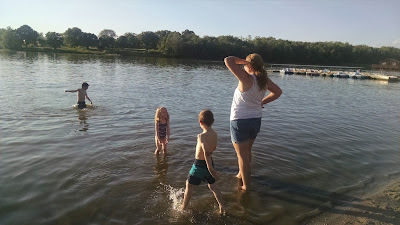 Monday we put the finishing touches on our summer vacation plans, ate breakfast on the patio while the minis played, got the house completely daycare ready for summer, and ended our weekend with a grill out at my grandparents house. 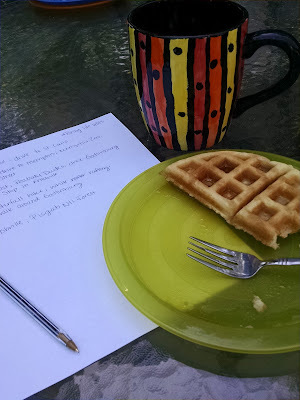 Nothing like homemade waffles, coffee, and vacation planning on the patio on a warm day. We are so excited to leave in 1 month for our big road trip! Part of me wishes we would have gone somewhere for a long weekend getaway, but it was great to get things done. 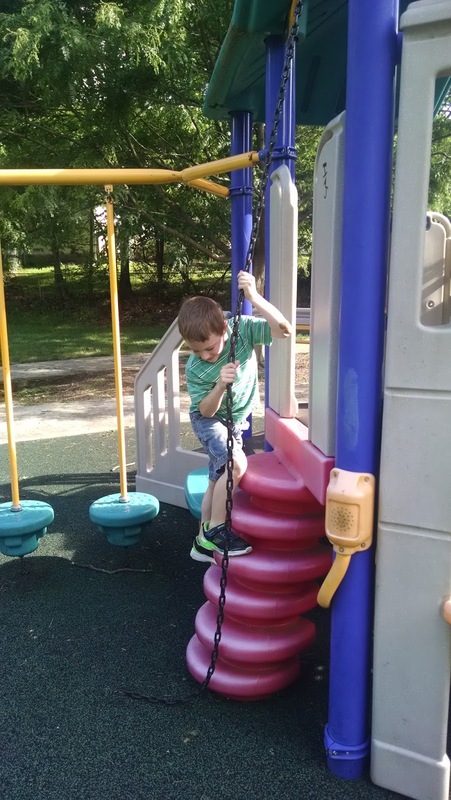 For all of the fun we have, there's a LONG list of to do's that gets neglected. 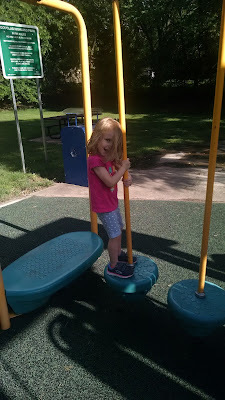 My goal for the summer is to work out a way to fit in the neglected to do's while still having some fun.